This week I was trying to get a feel for what the disciples were thinking and seeing as they walked through the great Temple in Jerusalem. Through the power of the web I was able to find out a great deal about the size and layout of the Second Temple, which had been renovated by Herod during Jesus’ lifetime. The Temple complex, which is considered most holy ground by Jews, Muslims and Christians today, contains the Western Wailing Wall, and the Al Aksa Mosque. It all sits on a leveled out mountaintop that Solomon had built up with stone to make room for the first great Temple destroyed by the Babylonians in 587 BC. Herod built great walls surrounding this area and in Jesus day the walls enclosed an area about 36 acres, which is the size of seven high school football complexes with quarter mile tracks surrounding them (about 5 acres each), laid out side by side. The Wailing Wall is what remains of Herod’s walls and it is about 187 feet high. For perspective, that is about the height of Giant Stadium in New Jersey or the height of a 12 to 15 story building. So this was a huge open air complex that would have swallowed Giant stadium. For historical comparison, this is larger than the Coliseum in Rome, which ironically was built in 70 AD, the year the Temple in Jerusalem was destroyed. So this truly was one of the wonders of the ancient world and the disciples were justifiably in awe walking into the outer courts. So in the presence of such grandeur on holy ground which is revered and fought over by three great religions of the world, why is Jesus so unimpressed? For clue number one let’s start with who built it-Herod. If you remember your Christmas stories, Jesus had reason to not hold Herod in high esteem, since his family had to flee to Egypt to escape Herod and the slaughter of the innocents. So Jesus may have a few left over issues with any landmarks of Herod’s grandeur. Where others gaze in wonder, Jesus sees blood money, taxes pilfered from people who can’t afford it, national wealth spent on Herod’s glory while people suffered in poverty. Beware that you are not led astray; for many will come in my name and say, ‘I am he!’ and, ‘The time is near!’ Do not go after them. 9“When you hear of wars and insurrections, do not be terrified; for these things must take place first, but the end will not follow immediately. Nation will rise against nation, and kingdom against kingdom; 11there will be great earthquakes, and in various places famines and plagues; and there will be dreadful portents and great signs from heaven. 12“But before all this occurs, they will arrest you and persecute you; they will hand you over to synagogues and prisons, and you will be brought before kings and governors because of my name. I believe Mark’s Gospel was written right after this terrible atrocity, so it is no wonder that he has the sharpest contrast between Jesus and the Temple Priests. 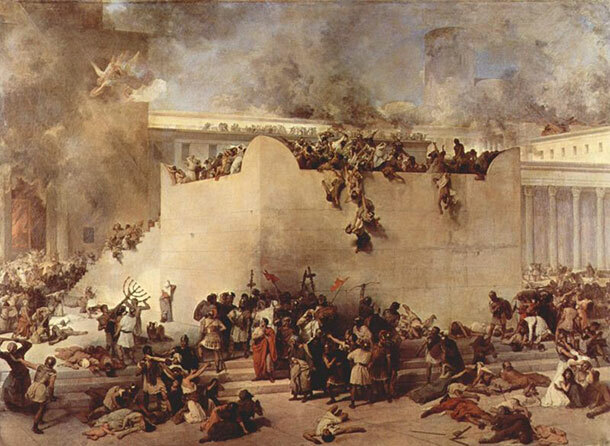 Mark is making clear that Christians had nothing to do the Jewish rebellion that lead to the destruction of the Temple. In fact, they were oppressed by the Temple aristocracy as well. Jesus warned them and see what they did to him. Mark is saying to Rome, “We aren’t them, so don’t kill us too.” Luke is writing later and is more circumspect. His message is to not lose heart or be lead astray during terrible times, for Jesus will guide you through. Don’t be impressed by wealth or grandeur because it does not last, but also don’t be overwhelmed by tragedy, because that will not last either. This is an important message in our uncertain times. I said to Jeanne this week that these days feel like my youth during the farm crisis. I watched a way of life end in bankrupcy for many friends. I wonder if today a way of life for the suburban American middle class in ending as well. The days of working for IBM your whole life and comfortably retiring are over here in the Hudson Valley. Ever increasing prosperity and the American Dream of owning your own home are under threat. I think we need to find a way between the doom and gloom of expecting the next Great Depression and thinking that everything is going to return to normal. Life as we know it in America may be completely altered, but maybe it is a chance for new dreams, a vision of life that is more sustainable and not as harsh on our planet and natural resources, a way of life that is less materialistic and more oriented to community. As Jesus reminds us, tough times can be an opportunity for the church. Don’t cringe in fear at all the change and financial uncertainty. The world has need of us. Remember Jesus was more impressed with the widows two coins than the grandeur of the Temple, so let us not diminish what we too can give our world.